From left Viliame Siganaqavoka, Jone Seniceva and Mosese Vuvaina appeared at at the Nausori Magistrates Court yesterday. They are alleged to have killed Albert Vakadewavosa. Photo: Ronald Kumar. Three men charged with murder in connection with the death of a 48-year-old man in Veiwalai, Vusuya, Nausori, last Friday appeared at the Nausori Magistrates Court yesterday. 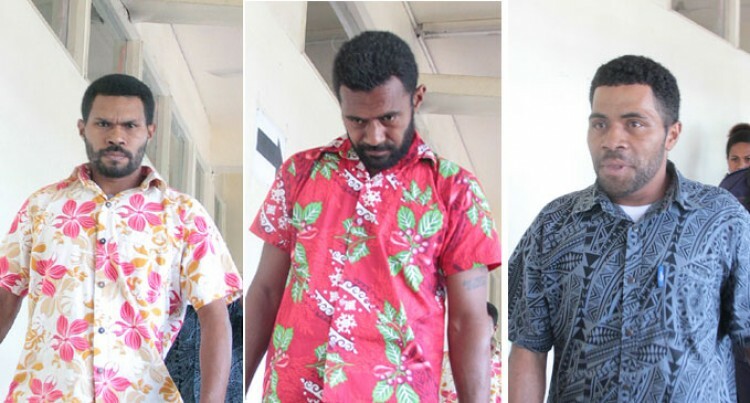 Jone Seniceva, 32, Mosese Vuvaina, 32, and Viliame Siganaqavoka, 29, appeared before Magistrate Vandhana Lal. The three are charged with a count of murder each. They were alleged to have killed Albert Turusi Alipate Vakadewavosa last Friday during an alleged robbery. The charges were read out in Court and the accused had sought Legal Aid assistance. The State lawyer yesterday informed the court that the first set of disclosures had been served. The lawyer also made an application to have the matter transferred to the High Court citing it was an indictable offence. The lawyer also objected to the bail application of all three accused saying that given the circumstances, it was a serious offence. She said it was also highly likely that the three accused would not appear in court for the charges laid against them if they would be released on bail. The State lawyer objected to Vuvaina’s bail application on the grounds that he had had a previous conviction of assault causing actual bodily harm. Magistrate Lal requested for sureties of the three accused. They were required to have a surety each. The State lawyer again objected to the sureties of the three accused. She said Seniceva’s surety who was his younger brother, had no authority over him because he was his younger brother. She objected to Vuvaina’s surety on the grounds that his surety was his neighbour. She said his neighbour would also have no authority over the accused. She also objected to the surety of Siganaqavoka citing that the accussed’s surety was his nephew. Magistrate Lal ordered that the matter be adjourned to Friday for bail ruling for all the accused. The three have been further remanded in custody.